Sometimes you just want something really easy to cook, that tastes great and is relatively healthy and good for you. Grilled fresh fish almost always meets those requirements when youâ€™re at the beach. I have featured several similar posts in the past but this is what I eat a lot of. Show me a super fresh talakitok and you can almost bet I will grill it sometime soon. While at the market last week, I thought I had finished with shopping but on the way out I saw a huge pail being brought into the market with some spectacular looking talakitoks on top. I immediately did an about face and followed the pail to its intended vendor and said â€œthose are mine!â€ After some haggling on price I took home 3 of the freshest looking talakitoks I have seen in several months. 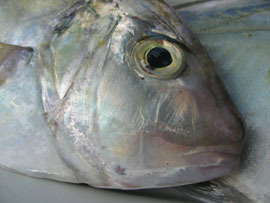 With eyes so clear and the skin still glistening with an almost saliva like freshness these looked like a real catch. Back home, they were cleaned and seasoned with salt, some coriander stuffed in their stomachs and grilled over a coal flame. A medium sized fish and some rice and some vinegar and I am a truly happy camper. Since we had guests, I thought I would add a little zing to the dish by making a really easy salsa. Chop up some tomatoes, green or Indian mangoes, add some chili peppers, lime juice and chopped coriander or wansoy and season generously with salt. Allow this to sit for about 30 minutes for flavors to develop. i am just drooling here with envy, lunch break is in half an hour’s time and my baon is spaghetti with bacon and dried porcini mushrooms sauce. but i’d rather have what you have here, MM. nothin’ like fresh fish to grill…if it’s straight from the ocean, you don’t even need to remove the innards. Hello, Marketman, congratulations for your site, it is great. Let me introduce ourselves: Me (Jeronimo, a spanish language university teacher, native from Dominican Republic) and my wife (Masumi, a japanese herb and aromatherapy teacher) both in our forties, live in Fukuoka (Japan). Well, my wife and I will very soon have an unexpected chance to do a short trip (for the first time in our lives) to the Philippines, since I will have the chance to attend a spanish teachers meeting at the Instituto Cervantes in Manila on Friday April the 28th. But as we have no idea of where to go to see or eat those authentic Philippine foods, I just thought to myself: “Why don’t you try asking MARKETMAN for some advice…? It would be fantastic if you could have some minutes to write some advice to us. hello market man, my husband did’nt like mango at the time we get married.. but when i made unripe mango-tomato salad similar to your relish ..he started to like it, but not the Brazil or african variety. Jeronimo and Masumi, aside from MM’s blog, whoch we all agree is awesom, you might want to try checking Anton’s blog, Our Awesome Planet (http://anton.blogs.com). and by the way i have been feeding the crew and i have sent them to food heaven show off no? Yummy! I always eat grilled fish with calamansi/fish sauce dip. Now, I will definitely add mango salsa. 1. At about 8am go to the Salcedo Market in Makati…this is an upscale small but nice market that is pedestrian and tourist friendly. Here you will see many cooked filipino foods and some produce and herb vendors. Look for Joey the vegetable guy, Gil Carandang, etc. All of these folks I have featured in my blog before, check the archives. 2. Depending on how long you stay at the Salcedo market, you may then want to swing by a store on Pasay Road Makati called Balikbayan Handicrafts for a bit of touristy handicraft shopping. It has a wide selection, reasonable prices and nice staff. They normally give local residents 20% off so try and pass yourselves off as residents if you are buying a lot. You will find fantastic mother of pearl plates here, wood products, placemats, pearls, etc. 3. From Balikbayan handicrafts you can go to “Milky Way Cafe” on Pasay Road and the corner of Paseo de Roxas, just minutes from the handicraft store. The name of the cafe sounds strange, but oddly, it has very good filipino food. And since prices are reasonable, you can try several dishes. I also have an entry on this restaurant I think. 4. If you are still game for more, head to the Market!Market Mall in Fort Bonifacio, Taguig which is about 10 minutes from Milky Way if the car driver is good. Here you will find an outdoor market with fruits and vegetables and a flower section. There are also lots of carts filled with regional delicacies and sweets from all around the Philippines. The mall also has a flea market section up on the 2nd to 4th floors for bargains on clothing, etc. (cheap stuff…). 5. From there you could try heading to Chinatown for a food tour if there is one on offer (look up my links for Old Manila Walks) or a walking tour of Intramurous, the walled city (look up my link for Celdran tours). 6. If you want dinner in Malate, try the restaurant “Sala” which is generally very good. I have to warn you that I have picked some of the more tourist friendly spots as I don’t want you guys to feel disoriented and lost. Just make sure you have a car to take you around. If you really want to hit local markets, you might try Farmer’s market in Cubao (tons of stuff, but a zoo) or the FTI market in Taguig (but hard to find). Also, please visit other Filipino blogs for more suggestions…my links page might help. I hope this helps and that you have a nice trip to Manila. hola Jeronimo, this is interesting, my daughter is now at Instituto Cervantes working on her Spanish in preparation for her last year of high school in Madrid. I was just at Cervantes last week. they have a brand-new very nice facility, very modern, with an old club, Casino Espanol, attached to it on the side. My family is also originally from malate. i could show you around but unfortunately i will be in thailand until 4 May. One quick suggestion would be for you to go to the seafood market in Baclaran (the instituto cervantes people will know where), buy some seafood you like at the wet market there and have it cooked on the spot at any of a number of eateries at the back of the market. they will charge you a minimal cooking fee. just ask them for suggestions on methods of preparation for whatever you buy. you’ll get a true philippine eating experience there i think. gonzo, I toyed with suggesting that but wondered if it might be too much of a local experience, but if it interests you Geronimo, I did do a post on Seaside Market early in this blog… best to get there at 11 am or so due to air frieght arrivals of fish from the Southern islands. Also, jeronimo, in Malate i tend to hang out (aside from Sala, one of my favorite restaurants in Manila and which is excellent, as MM says) at Casa Armas, which was owned by a good friend before he passed away (car accident in Spain). The food is Spanish, or more accurately, Filipino-Spanish, not quite as good as restaurants in Spain but good enough for here in Asia. You can sit at the cozy, old bar and ask Domeng the bartender for a nice tall cuba libre while waiting for your food. One dish that is not quite spanish but is often ordered at Armas is the roast crab. You might want to try that. Casa Armas is friendly, non-trendy, ‘old’ kind of place where the staff are also old and know you by name. I much prefer it for a pleasantly quiet rum&coke night rather than, say, the very modern Greenbelt area in Makati, where your hosts will probably take you. well he did say he wanted a glimpse of the tastes, colors, and aromas of ‘real’ philippine food, shopping and eating. It doesn’t get any more real than seaside market heh heh. That’s another thing to like about this blog, very helpful people! I like the itinerary, MM. Including seaside market. It sounds good for balikbayans, too! Agree, a smart driver should make this trip a breeze. They might even try an after-dinner drive/stroll along Roxas Blvd.